23 year old Indian boxer Sunil Kumar (52kg) continued his consistent performance in the international arena with another strong display at Guiyang in the 3rd China Open Boxing Tournament. The railways pugilist, after bagging a bronze medal at the Konstantin Korotkov Memorial tournament in Khabarovsk, Russia, assured himself of another bronze medal by reaching the semi-finals. 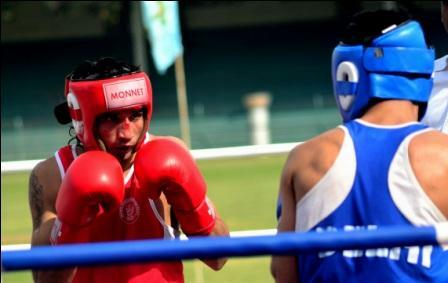 Rookie boxers Ajay Kumar, Jaideep and Manjeet Singh also made it to the penultimate round of the tournament. Ever since missing out on a medal in last year’s senior nationals, after losing out in the second round to Delhi lad Gaurav Bidhuri, Kumar has been keep to make his prowess felt. The former national champion has already made the cut for two tournaments this year and seems on track to cement his place as a regular in the national team. In the quarter-finals at Guiyang – boxing under the new ‘Ten-Point must scoring system’ – Sunil, a silver medallist at the inaugural China Open, was up against Artem Mirazaev of Russia. With his quick-fire jabs and swift body blows he put the Russian boxer on the back foot, right from the very start. Mirazev did well to squeeze in a few punches, but in the end it was Sunil who emerged triumphant on a split decision to march into the semi-finals of the tournament. He now takes on local lad Chang Young for a place in the finals. 19 year old Ajay Kumar (56kg) – playing his first international competition – also assured himself of at least a bronze medal finish in the tournament. He beat Philippines boxer Nico Magliquian in a split decision to advance into the semis, where he now takes on You Lunhai from China. Middle weight boxer Jaideep also secured a semi-final spot by overhauling Kazakh boxer Chingiz Verdybekov. But the Indian contingent suffered early setbacks in the women’s division of the tournament. Pinki Jangra (51kg), Preeti Beniwal (60kg) and Neetu Chahal (75kg) all failed to make it past the quarter-finals after losing out to their respective opponents. While Vs Xu Shiqi of China, Beniwal was upstaged by Alexis Pritchard of New Zealand and Neetu came up short against Magan Alila Maka also from New Zealand.